Vancouver Mayor Gregor Robertson made a friendly wager two weeks ago with Chicago Mayor Richard Daley over which city’s team would win the NHL playoffs. Each mayor put up a selection of local products they would give the other if their team lost. With the Canucks losing 5-7 to the Blackhawks in Game 6 in Chicago on Tuesday, Mayor Daley is the lucky winner. Mayor Gregor Robertson packs up the booty for Chicago Mayor, Richard Daley. Chocolate and Dessert Wine, the Perfect Blend? I don’t doubt that you can find a wine to pair with chocolate, but it’s not a simple thing to do. In fact, a port is often suggested. So why even venture down a path that may require the skills of a stunt person (aka sommelier) to perform? Is there not an easier option? With desserts, strong roasty stouts can demonstrate true brilliance, perfectly matching chocolate and providing a wonderful contrast to ice cream and fruit desserts. Wine, being incapable of true roasted flavors, can’t even come close. Chocolate raspberry torte with a Lindemans Framboise is a delicious combination. Yes, stout can pair with fruit desserts, just as you would use chocolate with fruit. When it comes to beer, the reverse is also true. You can pair a fruit ale with a chocolate dessert — young, sweet fruit lambics such as kriek, framboise, and pêche; an apricot wheat ale with Sachertorte to enhance the apricot/chocolate combination already in the cake; a cherry stout with Black Forest cake will do the same. So there you have it, folks. The ideal Valentine’s beverage is beer. And what dessert better epitomizes love than a Russian Imperial Stout Cheesecake? Gentlemen, if your quarry is beer averse, this will change her mind, especially if you made it. Ladies, finding it hard to get your man to drink what he scorns as a chick beer? This will send Cupid’s arrow through his heart unless a dislike of desserts covers it in chain mail. Ah, l’amour! A Province article on February 1 explained how their sports department attempted to discover “the best refreshing brew to enjoy” while watching the Super Bowl. Naturally, given the sports orientation of the exercise, this year’s “ultimate Super Sud” was to be determined by a “knockout-style bracket.” The contenders? BC’s eight top-selling beer brands and eight “lesser-known but still tasty” ones. The tasting panel was comprised of six males and one female. (Do we detect a bias?) For the results, read on and weep. Notice that seven of the eight are mass-market lagers. All eight are heavily advertised — ergo, the power of media in brainwashing the public. Many would call these everyday beers for the working man, but think of what really is the working man’s brew. Is it beer’s equivalent of Wonder Bread, a product mass-produced by a large corporation to appeal to the lowest common denominator in order to maximize profits? These contenders strike me as the equivalent of trying to find the tastiest meal by comparing McDonald’s with Burger King, Wendy’s, Subway, KFC, Panago, Tim Horton’s, and Denny’s. Because the food can be had fast and cheap, notwithstanding the ultimate high price paid, people are persuaded they are, somehow, good. “Phoenix” is actually Phillips Phoenix Gold Lager. St. Ambroise could be any one of eight beers produced by Montreal’s MacAuslan Brewing; in this case, it happens to be their Apricot Wheat Ale. In the first round, the match-up was between Corona & Yanjing, Canadian & St. Ambroise, Kokanee & Phoenix Gold, Budweiser & Bowen Island, Coors versus Innis & Gunn, Stella & Grolsch, MGD & Carlsberg, and Keith’s & Sleeman. Going on to the next round were Yanjing, Canadian, Kokanee, Budweiser, Innis & Gunn, Grolsch, MGD, and Sleeman. Except for the I&G, all the remaining contenders are lagers. In the Province article’s commentary, there were some interesting remarks. Corona was characterized as “bland” and “distinctly unimpressive.” So why is it the top-selling beer in BC? If you are what you eat/drink, what would that say about the people here? Of course, being the top-seller doesn’t necessarily mean that the majority of people here buy it. Those that like it may guzzle it a lot, but the rest of us may be justly satisfied with drinking less and drinking well. Naturally, the St. Ambroise was deemed a girly beer (“This isn’t a Super Bowl beer…”), so the female panelist was rapidly slapped down. But Innis & Gunn proved Kevlar to the Silver Bullet, keeping her in the game as it was her clear favourite. Kokanee trumped Phoenix Gold because it’s “a good, standard, hoser beer.” That clearly deserves a replay. Budweiser dominated Bowen Island, but all of the latter’s tasters were polished off. Sound like the game was rigged? Next to Grolsch, Stella was exposed as “swill,” “rancid and awful.” Better beer does tend to do that. The Sleeman Honey Brown was mischaracterized as an ale. I guess the panel didn’t think a lager could have such flavour. I was a Kokanee whore. Now I’m changing my ways. The second round pitted Sleeman against Yanjing, Canadian vs. MGD, Kokanee & Grolsch, and Budweiser vs. Innis & Gunn. Given the trend so far, one might expect Sleeman, Grolsch, and Innis & Gunn to get knocked out. Not so. Going on to the semi-finals were Sleeman, MGD, Kokanee, and Budweiser. Comically, Grolsch was characterized as a “Dutch ‘Budweiser. '” Nevertheless, the competition started getting serious. A former CFL player on the panel was reduced to cursing when Bud advanced. Now at this point, even when you’re drinking swill, the beer can start going to your head. The panel’s choice of sustenance to keep moving the ball forward? Pizza and chips — two of America’s favourite food groups. With the carbo loading out of the way, the taste of victory was in the mouths of the remaining competitors. Down to the five yard line? MGD and Sleeman! Who’s going to kick the winning field goal? The five times cold filtered contradiction (hint: draft means it isn’t in a bottle) or the beer of colour that’s actually a lager? Potential spoiler: the writer notes that Sleeman comes in clear bottles and “some have said that the taste can be affected by the exposure to light.” However, the panel didn’t seem to think so. I imagine it’s because their bottles weren’t light struck (thus, it’s conclusive this is a myth!). Ever wondered why beer bottles are mostly brown? Despite the handicap, Sleeman Honey Brown is voted the Super Sud. Why? “…having slogged through so many lighter-tasting beers, they all began to taste the same. But not Sleeman’s.” Wow! A sports-centric group tiring of beer monoculture? We may be starting to get somewhere. But given the glacial rate of progress, I’m not quite prepared to hold my breath. Calling beer “suds” doesn’t indicate to me an appreciable degree of respect for the beverage. Would you catch a writer referring to wine as “plonk?” Only if it were meant to indicate derision. The first problem with this competition is that the goal was to pick a single beer to imbibe for a whole eight hours. Why do you have to drink just one for the entire duration? What a bore! The other problem was the selection chosen to begin with. Twelve lagers out of 16 evaluated? That’s a distinct stylistic bias. The rabble have yet to discover bocks, porters, dubbels, tripels, quadrupels, saisons, lambics, alts, barley wine, bitters, milds, IPAs, Scotch ale, bière de garde, Rauchbier, Roggenbier, Koelsch, wood-aged ales, red ales, brown ales, Trappist ales, spiced ales, Russian Imperial stout, sahti, Berliner Weisse, Australian sparkling ale, etc. It’s kind of like the Titanic hitting an iceberg: the extent of what exists is not visible from what is merely in the surface. I’m always puzzled by the strong association of light lager with American football, as epitomized by the Super Bowl beer commercials. If football is such a macho sport, then why do jocks think it is très cool to drink such wimpy, characterless beer? Something more fitting would be a chewy IPA or stout. When faced with the latter, however, the sport nuts are scared of the dark and want the light turned on. Maybe it’s time to re-evaluate their image. In the meantime, stay tuned for periodic beer evaluations from the Thinking Drinkers tasting panel. They will be more even-handed evaluations with an even split between male and female participants. For inspiration, my “first-down” this evening is going to be one of the last bottles of R&B’s Hop Goblin’, which will be replaced with a new brand: same IPA, different name. We can thank the litigious limeys at Wychwood for that. As I mentioned in a previous post about the importance of imports, an outside stimulus to the derriere is sometimes necessary to motivate one to reach beyond the rut or comfort of stasis. That swift kick may come in the form of competition from imports. It can also come from the introduction of new domestic products. The whole idea of extreme beer is bad for craft brewing. It doesn’t expand the tent—it shrinks it. If I want someone to taste a beer, and I make it sound outlandish and crazy, there is a certain kind of person who will say, ‘Oh, let me try it.’ But that is a small audience. It’s one that you can build a beer on, but not a movement. I think Oliver is right—you won’t build a movement on extreme beer, one that will get the macrobrew drinkers to switch over to craft beer. However, I don’t think that’s the point of these beers, nor is that what Calagione, for one, is intending for them to do. Broadening the diversity of beer does expand a corner of the craft beer tent; we just need to find a way to bring more people under the tent. Look at Europe for contrast. The competitive landscape there is shrinking as breweries consolidate or are forced to close, reducing the amount of choice to consumers. Brewing there is increasingly about the bottom line, not the beer. That means Edward Scissor Hands is in the driver’s seat. This is why consumer organizations like CAMRA, PINT, and Zythos have circled the wagons to protect their brewing traditions from being destroyed by corporatism, just like Slow Food has done for cuisine. In North America, on the other hand, the craft beer market is growing. This provides the competitive impetus for innovation. How does a brewer distinguish themselves but by coming out with something completely different, even original. American brewers have covered the common European beer styles quite thoroughly, even adding their own stamp to the degree that it has warranted creating American sub-categories. Now they are venturing into more esoteric styles, ones that are nearing extinction in the Old World—Gose, Kellerbier, Sahti, Steinbier, Wassail, Zwickelbier—and ones from the really old world that, until recently, have been gone for centuries and only revived through archaeology. Even traditional lambic is finding a dwindling audience. With the U.S. being such a large market, there is room for ballsy brewers willing to push beer’s outer limits to succeed. The small market of B.C. makes it a lot harder unless you have some good financial backing and top notch marketing. Unfortunately, our breweries comfortably in the black are largely run by people in it for the business opportunity, not the beer. Don’t expect them to be raising the bar on creativity, much less release seasonal beers. To find the cutting edge in B.C., you’ll have to dig deeper and keep your ears open. What could be considered extreme beer here is often found at the cask ale festivals at Dix BBQ and Brewery in August and December. If you want more of a good thing, then you should make a point of attending and encourage the brewers willing to take a chance. A curry pale ale, anyone? As the weather becomes colder, the winter warmers are starting to make their appearance. This means it will be easier to find Russian Imperial Stout for this recipe, which is not commonly made by B.C. breweries who package their beer. Suitable beers for this cheescake are Brooklyn Black Chocolate Stout, Flying Dog Gonzo Imperial Porter, Moylan’s Ryan O’Sullivan’s Imperial Stout, North Coast Old Rasputin, and Phillips The Hammer. If you can’t find any of these at a BC government liquor store, try a private one. Add a scoop of French Vanilla ice cream to any of these, and you have a delicious beer float (I kid you not!). Russian Imperial Stout Cheesecake served with preserved Bing cherries and cherry syrup that was served with a Lindemans Kriek. Preheat oven to 325°F (or 300°F if using a dark pan). Grease the sides of 9″ spring form pan and cover bottom with wax paper. Mix crumbs, 2 tbsp sugar, and melted butter in a bowl until evenly blended; press firmly onto the bottom of the pan with a fork. Beat cream cheese with an electric mixer until smooth, then add remaining ingredients (except eggs) at medium speed until well blended. On low speed, add eggs one at a time, mixing each until just blended. Pour batter over crust. Bake 55-60 minutes or until centre is almost set. Loosen cake from side of pan by running a paring knife around the inside edge. Cool on a wire rack to room temperature before removing side of pan. Refrigerate for at least four hours or overnight. Store any leftover cheesecake in the refrigerator. Adapted from Michel Brown’s Russian Imperial Stout Cheesecake by Fred Eckhardt in Northwest Brewing News, Feb/Mar 2008, Volume 7 Number 1, pg. 29. * NOTE: You can use Oreo cookie crumbs for the chocolate graham crumbs. I also thought there was way too much sugar for the batter (American recipe), so I halved it, using only 1/2 cup. With the beer/chocolate combination I used, this amount of sugar was perfect. You may be able to get away with using even less, depending on the chocolate and beer you use; taste the batter before pouring it into the pan to see if you need to add more sugar. I would recommend a good quality chocolate with at least 60% cacao. I used an organic dark German chocolate found at Choices Markets; Belgian Callebaut would also be a good bet. To degas the beer, a trick I learned from a brewer is to pour the pint of beer into a small container or pitcher, then pour it back and forth into another until the head dies down and the beer goes flat. To serve the cheesecake, berries are an excellent complement — raspberries, strawberries, cherries, black currants. When plating the cake, you could crown the slice with a dollop of whipped cream topped with a berry and mint leaf, then surround the cheesecake with a coulis made from the same fruit. This is a classic Valentine’s dessert — sinfully rich chocolate and the fruit providing the red colour of love. To pair a beer with the dessert, use either the beer used in the cake or a fruit lambic that is the same as the fruit you used to complete the presentation. If you want to impress dinner guests, stout should be served at cellar temperature in a cognac snifter and the lambic, like champagne, chilled in a flute. Two events I recently attended have shown an increased interest in beer & cheese pairing — FigMint’s B.C. Day “Beer on the Wood” and the Vancouver Beer Meetup/CAMRA lambic & cheese tasting at the Alibi Room. Cheese for both events was supplied by Mount Pleasant Cheese, who are becoming noticeably more beer savvy with suggested beer pairings on the tags of some of their cheeses in their Cambie Street shop. Chef Lee Humphries created an innovative pairing plate that not only included the common cheese, fruit, and some condiments with bread, but even some hors d-oeuvres to match both the cheese and the beer. For example, with the Farm House Castle Blue, he made a small skewer of pork sausage wrapped in tomato crêpe. For the Farm House Natural Chèvre & Pooka Cherry, it was a cherry soda & vanilla ice cream float and two fresh, ripe cherries. Great value for $25.00. The lambic & cheese tasting at the Alibi Room highlighted Belgian products recently imported by Bravo Beer of Squamish. Unfortunately, James Walton of Storm Brewing has been the only B.C. brewer to make this classic style of beer available commercially, but he isn’t planning on making it again. Yaletown Brewing brewmaster, Iain Hill, is working on a related beer — an Oud Bruin — that should be released in the fall. For such a challenging style and labour of love, these brewers should be given every encouragement. Twenty-six people enjoyed a selection of gueuze, fruit lambics, and faro paired with five cheeses selected by Nigel Springthorpe and I. The beers were a mix of commercial lambics from Brouwerij De Troch and Brouwerij Vanhonsebrouck, and traditional lambics from Brouwerij Oud Beersel. The cheeses were Chevry Plain from Carmelis Goat Cheese Artisan, Le Douanier from Fromagerie Fritz Kaiser, Le Bleu Ermite from the Benedictine monks of Fromagerie de l’Abbaye Saint–Benoît, Le Riopelle de l’Ile from Société coopérative agricole de l’Île aux Grues, and an extra aged Gouda from Gort’s Gouda. The tasting began with a comparison between Vanhonsebrouck’s St. Louis Gueuze and Oud Beersel’s Oude Gueuze Vieille. The cheeses best paired with these very sour beers were the stronger-tasting Le Bleu Ermite and Le Douanier. We then followed with a three-way comparison between De Troch Chapeau Kriek, Oud Beersel Oude Kriek Vieille, and Vanhonsebrouck St. Louis Premium Kriek. Duck confit croquettes would have nicely paired with the aged kriek, but people were hungry and devoured them even before the first beer was paired. The commercial krieks, the Chapeau Abricot, and the St. Louis Premium Framboise that were sampled after went well with the Chevry Plain and triple-cream Le Riopelle de l’Ile. The final beer of the evening’s tasting was the St. Louis Premium Faro. Unfortunately, the B.C. Liquor Store that the beer was ordered from did not fulfill the order for the Chapeau Faro that was planned for a comparison. Nevertheless, by that point, participants were quite satisfied and enjoyed the faro with the carmel flavour of the aged Gouda. If you are interested in doing your own beer and cheese pairing, see Janet Fletcher’s article on the subject in the San Francisco Chronicle. Third-hand brewing system originally from Flying Monkey Brewery in Olathe, Kansas. Just when you thought Victoria had enough breweries, another one is about to float in on the capital’s wave of craft brewing success. Driftwood Brewery is a new venture of Kevin Hearsum and Jason Meyer, formerly of Lighthouse Brewing. Meyer, Driftwood’s brewmaster, is a BJCP certified beer judge, past President of the Edmonton Homebrewers’ Guild, and Alley Kat’s first employee. 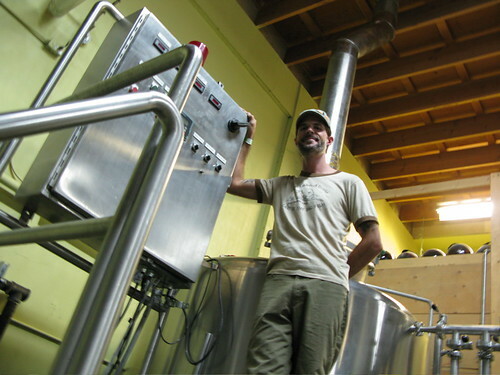 Driftwood brewmaster, Jason Meyer, stands in front of his vented mash tun. This is welcome news for B.C. We won’t have to import Belgian-style beer from Quebec, the U.S., or Europe to get our fix. There is a building interest in Belgians with many brewpubs and micro-breweries releasing fruit beers, dubbels, tripels, and Wits, Granville Island being just the latest with their limited release Belgian Wit now available. James Walton, brewmaster of Vancouver’s Storm Brewing, has been the most experimental with his phenomenal fruit lambics that were ahead of their time for sufficient acceptance by the local market — unfortunate because he is no longer making them. Spinnaker’s Rob Monk released a saison at the beginning of this year that tasted more like an abbey ale due to the predominant presence of bubble gum in the flavour profile. Nevertheless, I hope he continues to work on this versatile style. 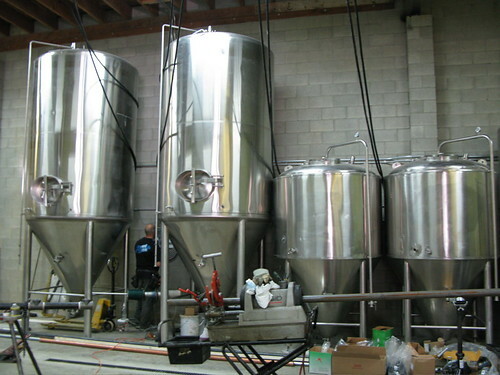 Driftwood is currently under construction; they just received their brewing equipment this week. If you are interested in following their progress, you can track it through their Facebook page. And while Hearsum and Meyer have already made dozens of experimental brews in their pilot brewery, they don’t expect to be in production until the fall. Their goal is to produce 2,000 hectolitres in the first year and 5,000-7,000 hectolitres within five years. Although they intend on exhibiting at the GCBF, Meyer doesn’t think they will have any beer to offer. Nevertheless, I”m sure they’ll be happy if you stopped by for a chat.